View showing the waterfront of Liverpool and traffic on the River Mersey. There are many sailing ships docked here in the various docks. During the 18th century a number of docks were built: the first in c.1709-21, Salthouse Dock in 1734, Canning Dock in 1753, George's Dock in 1767, Duke's Dock in 1773, the King's Dock 1784, the Manchester Dock of c.1785. Various buildings can be seen along the waterfront, one of the spires is of St George's Church, but it is difficult to identify the others. 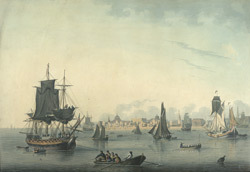 By 1800, the population of Liverpool had reached 80,000 and it had prospered as a port, importing cotton for Lancashire's growing textile industry.